Long rumored…really long rumored, the folding smartphone will finally roll out in 2018…at least that’s what DJ Koh, CEO of Samsung Mobile is saying. Macrumors.com reports that Samsung plans to drop a model of Galaxy Note that folds by the end of the year. It will have a giant screen made of the two sides inside, and a third screen when folded on the outside. The phablet is rumored to be 7 inches diagonally, but can be folded in half much like a wallet. Samsung may show it off at their developer conference in November. Xiaomi plans to beat every other smartphone maker to the punch, releasing the first 5G smartphone in the Mi Mix 3 later this year. 5G is going to be stunning…with download speeds 10 times that of 4G. Mashable.com notes that right now, only Verizon has any 5G, and that’s just in 3 cities and only at fixed locations…so not really mobile. 5G is expected to be more widely available in 2019 and 2020, and look for many handset makers to debut 5G phones by then. For this year, though, if you want to be first on your block with 5G capability, it’s going to be Xiaomi! 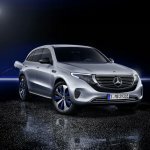 Mercedes has finally given a real look at their EQC e-SUV, which was first teased as a concept car at the Paris Auto Show two years ago. According to arstechnica.com, it goes into production in 2019, and will be on sale in 2020. Mercedes is touting 402 horsepower and up to 200 miles of range on a charge. The e-SUV will roll on the same wheelbase as the hybrid or fueled GLC, but is a little tighter…a bit shorter, thinner, and sporting a bit lower profile. It will run a pair of motors…one for each axle. Mercedes says it will charge from 10% up to 80% in 40 minutes. Snap is showing off a couple new styles of frames for its Spectacles 2 video glasses. Thee frames are still oversized, but aren’t the total round, uber-nerd shape of the originals. Engadget.com says they are on sale at Snap’s website for $199. The frames are dubbed ‘Nico’ and Veronica,’ although Snap showed both on female models!